Before defining a brand identity the first important step is: to know everything about the brand & company. For that you need the right tools. Desk top research and quantitive data are of course are important – and here Annette’s experience from her early days came in handy: The methods and skills in analyzing quantitative research. But to define a brand you need a lot more. Brands are not created by agencies and studios. We may come up with ideas and directions – but at the end of the day it’s the people who works with your ideas and visions that forms the brand. So if you want to create the ‘right’ brand identity and make sure that the strategy behind is successful, you have to listen to and understand the people who ‘forms’ the brand. For two reasons. First you must be sure you know ‘everything’ important to base your recommendations on. Second you have to make sure that people get involved and feel that they are part of your ideas and recommendations. Running workshops was one of the ways Annette got people involved. To get people to open up and talk about not only the qualities of the brand, but also reveal the small things that they don’t think are important, the things that indicates the values and energy behind the brand – she needed some tools. The first tool I introduced at e-Types was based on an old technique from my time at BBDO called photosort – sorting photos of different people according to their brand use. 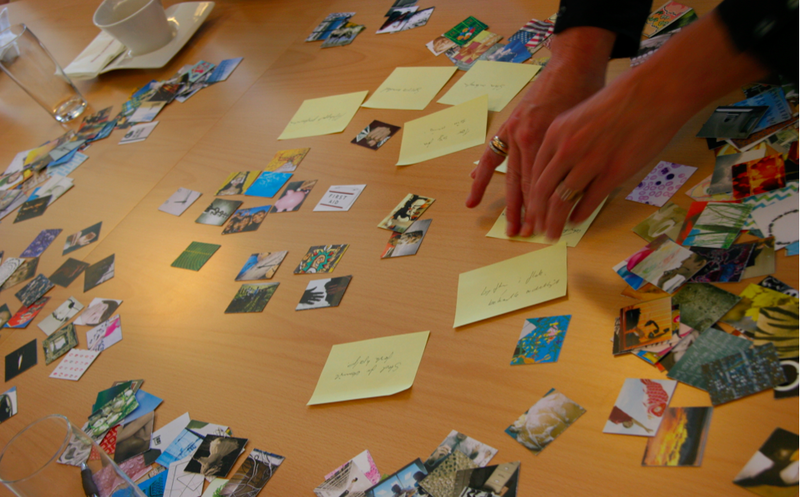 To make the process more intuitive and fun and get deeper insights I used the idea of sorting, but in a completely different way: I created cards in different categories: Animals, shoes etc. Using pictures of something far from the brand in questions, but something you could easily relate to, was a fun way to reveil the softer side of the brand – the attitude, the personality. In the workshops I used the cards category by category, asked the participants to choose cards that represented ‘them’ and/or their brand/company. Are you a parrot or en eagle? Or a cow? Why? It was almost like playing a card game where everybody adds cards and sometimes removes the cards other people have chosen. The important part is of course is the discussions that happens when people add and remove each others cards. And the process to reach consensus around the final selection of cards. Very often already at this point important issues about the brand/company arise. We named this tool SORT. While developing SORT Annette joined forces with designer Silje Kamille Friis who were then making her business PhD at e-Types. Together they developed the tool DISCOVER. While the SORT cards had more or less given associations – and worked as a perfect opener for a workshop – we needed something to dig one step deeper. Something with more open associations. So we made the smaller DISCOVER cards – a lot of them and in no special categories, just all different – photos, drawings, cartoons, patterns, colors, texture etc. One big mix. We used the cards in very different situations and ways: In brainstormings – about concept development, name or activities, etc – we would draw cards randomly and use the spontaneous inspiration from the card to generate ideas. It gave a lot of energy to the process, setting completely new directions. In workshops about identity we spread out the cards and ask each participants to find cards that best expressed the values of the company/brand. The cards always evoked something – feelings, attitudes, emotions, energy etc. – they hadn’t thought about or put word on, but was important to see and discuss. Before a new project Annette and her colleagues designed the whole process based on the client’s needs. In most projects – whether developing new concept for a Scandinavian bank or defining the identity of an international fashion brand – the SORT and DISCOVER cards were used. But they created lots of other methods during these years. Some used for many projects, others modified for the specific situation and very often they created a completely new method for a special client. With all the insights collected the main task started – organizing, decoding, finding drivers – and into the essence. Defining what the company/brand is about in the brand platform. The most efficient tool for a company to use afterwards was a very simple model with 4 elements and the essence in the middle. Annette could use days to find the right 4 elements and essence – the elements that defines and describes the company in a way that shows the driving force behind. Annette and her colleagues often made 2-3 scenarios to discuss with the clients – a good way to illustrate that you have to make a choice. You cannot be everything at the same time. Different essences has different implications on everything you do, so in the final stage of the brand identity work the client has to make the decision which way to go. The Cut Out Doll – one of the tools Annette and Kamille tailor made for the design workshops at e-Types. 4 ways to describe a Brand’s essence in 4 elements. Click to enlarge.